More than 1,300 axlebox bearings and gearbox bearing sets have been successfully delivered to Hitachi Rail Europe’s flagship train maintenance centre in Ashford, by Schaeffler (UK). 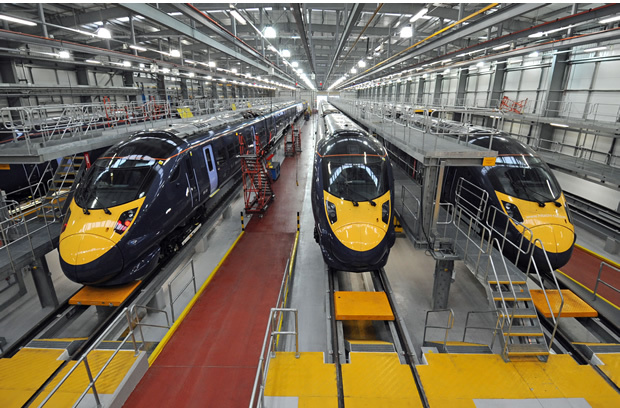 As part of an on-going bogie overhaul programme of Hitachi Rail Europe’s Class 395 ‘Javelin’ high speed trains further deliveries are planned this year. Built by Hitachi, the Class 395 Javelin trains offer the fastest domestic service rail travel in the UK. In 2008, the Javelin completed its first rail journey from Ashford in Kent to London St Pancras in just 37 minutes. The Hitachi trains went into full passenger service in December 2009 on the High Speed HS1 rail route. The Class 395 is a dual-voltage Electric Multiple Unit (EMU) built for high speed commuter services on HS1 and elsewhere on the Integrated Kent Franchise. The Hitachi Class 395 trains operate at a maximum speed of 140mph. The trains consist of six-car units, with all axles on the middle four cars powered. The outer cars are unpowered. The bogies are bolsterless, with both powered and unpowered bogies sharing a common design to simplify maintenance. Each six-car unit can work in multiple with another, creating 12-car trains. Since the Hitachi train has been in service, Schaeffler UK has worked closely with Lucchini UK, the company responsible for the bogie overhaul on the Class 395. From its Manchester base, Lucchini UK provides a full wheelset service package for the Class 395 trains, including inspection, re-wheeling, reprofiling, axle skimming and supply of new axles. The company also specialises in the inspection, overhaul and maintenance of wheelsets, train gearboxes and final drives to UK-based operators and train maintenance contract holders. Lucchini and Schaeffler UK have collaborated on a number of improvement projects for the Class 395, including mileage extensions and condition monitoring of the drive train, including axles, traction motors and gearboxes. The current overhaul programme, which started in 2014, has seen Schaeffler supply 480 gearbox bearing sets and 840 TAROL axlebox bearings to Lucchini. TAROL (Tapered Roller Bearings) units from Schaeffler are used primarily as axlebox bearings on rail vehicles such as goods wagons and passenger carriages. Axlebox bearings comprise the interface between the wheelset and the bogie frame and so are subjected to extreme loads. TAROL units are double row tapered roller bearings supplied with factory-set clearance, greased and sealed for life. These high reliability units are therefore supplied ready-to-fit and are pressed onto the shaft journal in a single operation using a hydraulic unit. Due to the press fit of the unit on a shaft journal of a diameter within the specified tolerances, the bearing support achieves the required axial clearance. As well as supplying TAROL units for the Hitachi Javelin train, Schaeffler is also supplying a variety of gearbox bearings. These include both cylindrical roller bearings and four-point contact bearings, which stabilise the gearbox shaft and support the transmission of forces. In doing so, the bearings must withstand extreme loads under complex environmental conditions such as high vibrations, high speeds and high temperatures. Schaeffler with its FAG and INA brands boasts more than 100 years’ experience in the rail industry, with applications including axlebox bearings and housings; bearings and components for traction motors and gearboxes; railcar connectors; braking; tilting technology; and bearings for train doors.